Market opportunity driven by large population of patients that go untreated, as well as limited safe and effective options. Onychomycosis is a highly prevalent fungal infection affecting 35M people in the US. • Fungal infection of the nail and nail bed. • Without treatment, it can damage the nail unit and spread to other toes and skin. • Affects 1 in 10 people, 85% of whom do not seek treatment due to limited safe and effective options. • Affects 1 in 3 diabetics, increasing risk of secondary infections, foot disorders and limb amputations. • Local, non life-threatening infection – fundamentally ought to be treated topically. GX-03 has shown impressive effectiveness in early trials, including on stubborn, chronic onychomycosis. To cure onychomycosis, the optimal topical drug must be small, occlusive, and lipid based in order to penetrate lipid bilayers in the nail and reach the nail bed. Fungus resides in the nail bed; if the drug cannot reach the nail bed, it cannot cure the disease. 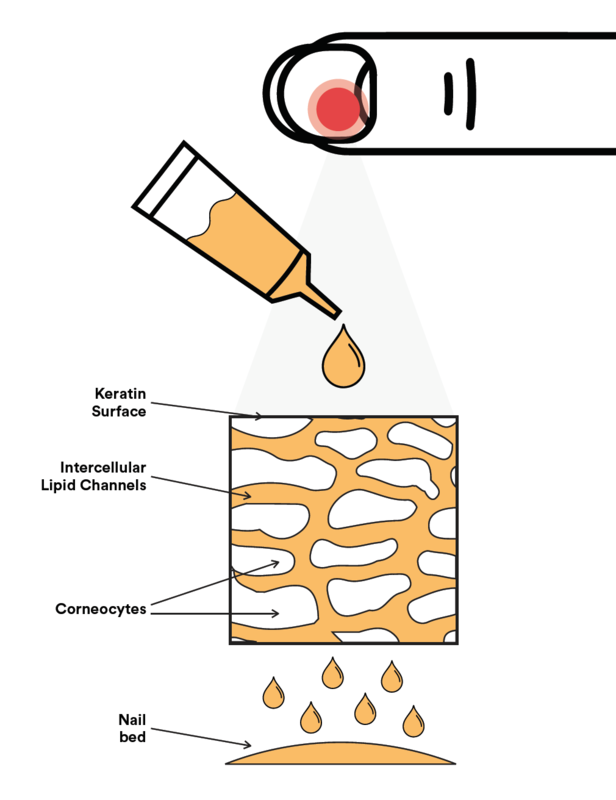 Our technology penetrates the keratin surface, carries active ingredients through the channels of the lipid bilayers, and delivers powerful medicinals directly to the site of infection.